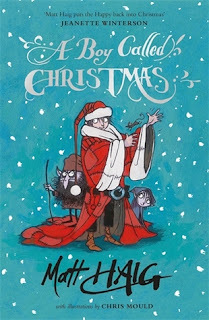 Synopsis: You are about to read the true story of Father Christmas. Review: It really doesn't matter how young or old you are there is nothing better than a Christmas story. A Boy Called Christmas is perfect for the holidays. Not only does this story feature Christmas but it reminds us to be kind, loving, giving beings. We all have those classic stories that are a part of Christmas, reading this new book felt just like reading an old favourite. So easy and simple to read, yet it didn't feel like a children's book. I love the fact this story gives a reason for everything we know and love about Father Christmas from how he got his name, why he wears red and most importantly just how does he get down the chimney? I now have the answers to life's most difficult questions! Right from the little ones to the big ones everyone needs a little bit of magic, this is the perfect book for that this Christmas. Whether you celebrate Christmas or not I wish you all happy holidays lovely readers! Hi reader! I'm Ellie and I'm 26. I'm a Bookseller from Nottingham, England. Welcome to my blog, I hope you enjoy what you find here. Top Books I Need to Buy!